Far-left extremists vandalised a monument to former Polish King Jan III Sobieski who broke the Turkish siege of Vienna in 1683 ahead of an event put on by the hipster-right Identitarian movement to celebrate the anniversary of the battle. 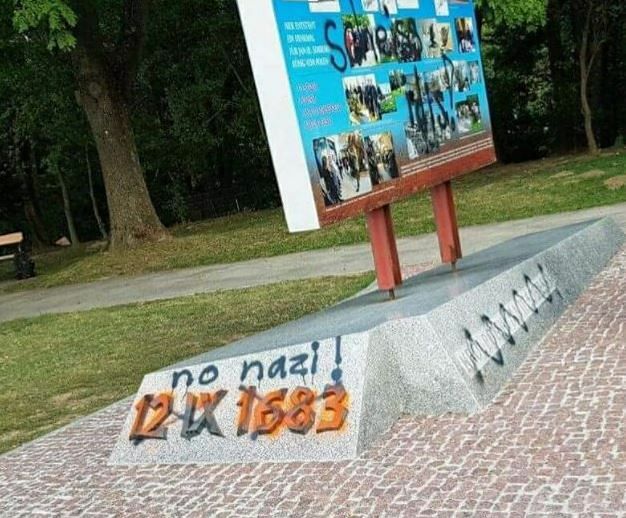 The left-extremists wrote “no nazi!” and crossed out the date, ’12th of September 1683′, on the monument to the Polish King who, along with his elite troops, the Hussars, broke the Turkish siege of Vienna. Far-left crimes are on the rise in Austria and in neighbouring Germany where earlier this year thousands of black-clad masked extremists wrecked havoc in Hamburg injuring hundreds of police officers. Since the Hamburg G20 riots, the German government has sought to crack down on far-left extremism and shut down the largest German-language website for the far left. In the U.S. the group, commonly known as Antifa, have had their actions designated as “domestic terrorism”.